The Eleaf Melo 2 Tank is the latest sub-ohm tank from Eleaf, offering 4.5ml capacity, adjustable airflow and a unique side fill design. Just twist to open and then top it off with your favorite e-juice without ever removing it from your device! 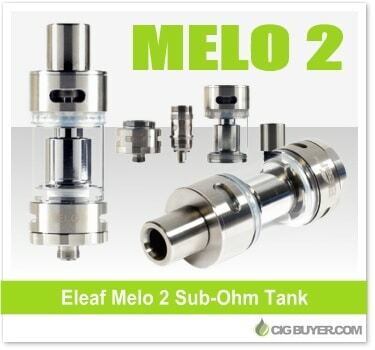 The Eleaf Melo 2 was built for simplicity, compatible with various replaceable organic cotton heads; including standard 0.3 ohm, or 0.15 ohm Ni200 and 0.50 ohm Titanium for use with temperature control. * Expiration of coupon code is unknown. Good while supplies last.